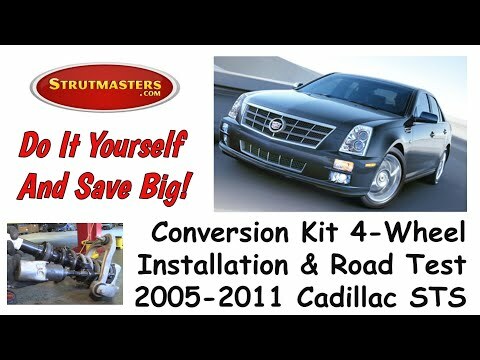 Strutmasters 1993-1996 Cadillac Seville Deluxe 4 Wheel Air Suspension Conversion Kit is the perfect solution to your air suspension problems. Designed to be very affordable, you can convert your air suspension to use standard shocks/struts and coil springs for less than the price of replacing one air strut. 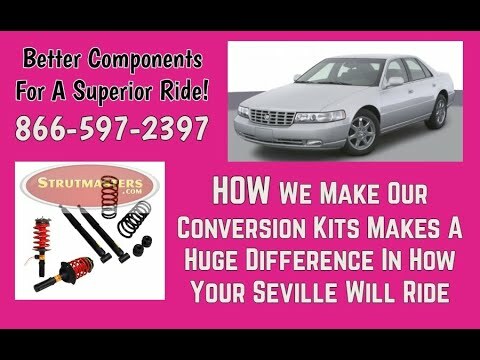 1993-1996 Cadillac Seville Deluxe 4 Wheel Air Suspension Conversion Kit With Resistor (CA34FR) is the perfect solution to your air suspension problems. Designed to be very affordable, you can convert your air suspension to use standard. This conversion kit consists of two passive gas and hydraulic fluid shocks and new coil springs for the rear, and two preassembled front passive struts complete with Eibach brand coil springs for the front. These shocks and struts are a passive alternative to the active suspension system on the Seville, which means that they don't rely on expensive compressors or electronic modules. You may remember the bit about how the original rear coil springs from the factory are relatively weak, poor in quality, and rely on inflated air shocks to keep the vehicle level. Our new coil springs are designed to keep your vehicle level, independent of your shocks. That way you are always riding at the proper ride height while removing stress from the shocks, allowing them to provide a comfortable, controlled ride for a longer period of time. How Do I know If My Seville (4.6L) Air Suspension is failing? Like most GM vehicles built with air suspension straight from the dealer, the 1993-1996 Cadillac Seville was built with electronic dampening coilover struts in the front and air shocks and coil springs in the rear. So when looking for air suspension failures in your Seville, you are going to gear your focus towards the rear of the vehicle. The rear of your Cadillac Seville will sag down quite a bit when experiencing total failure. Even though there are coil springs in the rear, they have a weak spring rate and are of poor quality. They are not designed to hold the rear of the vehicle level at the designated proper ride height without the air shocks being inflated. In order to catch your air system going bad before this point, always take note of any ride height changes before you get in your car and when you exit your car. Also, you may hear your air compressor running every now and again, which is okay. However, if you start to notice it running more and more often for longer periods of time, then it‚Äôs almost certainly your compressor starting to go bad. There could be a simple fix such as the replacement of some seals, or it could be that there is a leak in your air shocks and the pump has to operate harder to keep the vehicle level; unfortunately, it‚Äôs almost always the latter. Even replacing the air shocks with quality aftermarket air shocks or direct replacements from the dealer won‚Äôt fix the irreparable damage that‚Äôs been done to the compressor. + Struts ($215/strut) + Coil Spring ($179/coil spring) + Shock Absorber ($265/shock absorber) + Compressor and Dryer Assembly ($235) = TOTAL: Over $1,550 (and that doesn't even include replacing electronic components that are known to fail such as the height sensors). 1993-1996 Cadillac Seville Electronic Struts (x2)- a type of shock absorber; has metal tubing filled with gas-charged hydraulic fluid that is connected to the wheel of a vehicle in order to reduce the effects of vertical travel on a rough surface which controls the bounciness, and therefore comfort, of a vehicle. 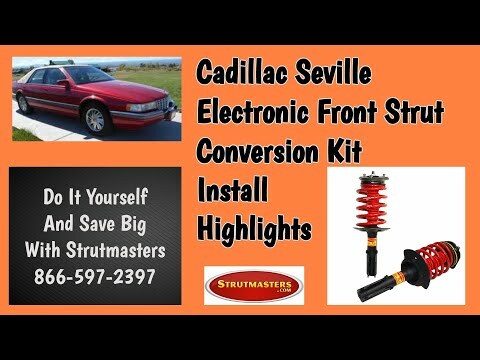 The Cadillac Deville's struts, while having coil-springs, use an electronic signal to stiffen or soften the dampening of the strut. 1993-1996 Cadillac Seville Shock Absorbers (x2)- a metal tubing filled with gas-charged hydraulic fluid that is connected to the wheel of a vehicle in order to reduce the effects of vertical travel on a rough surface which controls the bounciness, and therefore comfort, of a vehicle shock absorbers. 1993-1996 Cadillac Seville Coil Springs (x2)- Coil springs hold the vehicle up but be careful, they are rated for and designed to work with the rest of the suspension system, so when you change air shocks to passive shocks, then you will need a different rated coil spring that works well with the new type of shocks. 1993-1996 Cadillac Seville Air Lines- tubes that run from a compressor (air suspension) to the air struts which carry pressurized air to the air bags components in order to adjust the height of the vehicle, respectively. 1993-1996 Cadillac Seville Solenoids (x4)- usually L-shaped, these plastic components connect the electrical connection and lines of suspension components to the suspension control module on vehicles with active suspension. The solenoid regulates the air pressure for each air spring. Solenoids start to leak as they wear out causing the vehicle to sag or to lean. This will cause the ride height sensor to send a signal to activate the compressor in an attempt to inflate the air suspension and level out the vehicle. This excessive work load will eventually lead to total failure of the compressor. 1993-1996 Cadillac Seville Compressor- creates/sends pressurized to active suspension components. When the air suspension starts leaking, the compressor/pump starts working harder to try to keep the system inflated. By the time air suspension leaks down completely, sitting the vehicle on its tires, the compressor will either have failed or be well on its way to full failure. Buying replacement struts and taking the time to install them only to find out the compressor still needs to be replaced can be very frustrating, time-consuming, and expensive. 1993-1996 Cadillac Seville Dryer Assembly- used to keep moisture out of air lines and air springs in order to prevent freezing and internal cracking of these parts. Once air suspension starts leaking, moisture will build-up throughout the air system. Moisture damages the air suspension from the inside. The dryer will need to be replaced in order to eliminate the moisture and prevent any further damage. 1993-1996 Cadillac Seville Suspension Control Module- a computer which is responsible for the operations of the air suspension system and maintaining the vehicle's correct ride height. 1993-1996 Cadillac Seville O-rings- Although they are the least expensive parts of the air suspension, they are responsible for maintaining the seal where all of the air lines connect. Be sure to replace the O-rings when repairing any air suspension system. 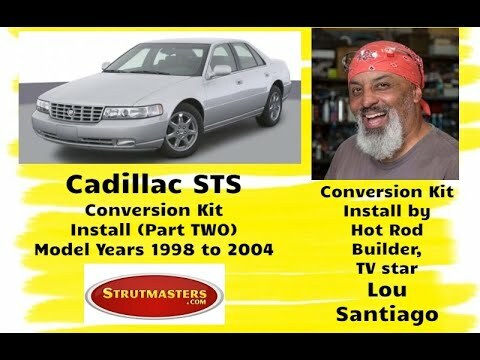 “This review would be for answering questions and placing an order with StrutMasters. He was friendly and professional. He answered all of my questions and confirmed that I was ordering the correct Strut Kit for my vehicle. He placed my order over the phone and reviewed all shipping options. Darrell also provided a great tip of making sure both front and both back wheels are jacked above the ground when performing the work on the Front and Back.